The AFL has its first ever female field umpire. 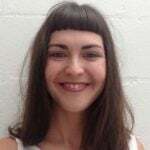 On Sunday Eleni Glouftsis will be the first female field umpire to adjudicate an official AFL match, the Carlton-Essendon pre-season game at Ikon Park. The 23-year-old began umpiring in 2008 and has spent the past two years on an AFL female pathway scholarship. This year she join’s the league’s rookie umpire list, which means she could be called on during the premiership season. “We’re really happy to say that Eleni will now make her NAB Cup debut this week,” Head AFL Umpires Coach Hayden Kennedy told AFL.com.au. Glouftsis was a teacher in Adelaide but moved to Melbourne to chase her dream. 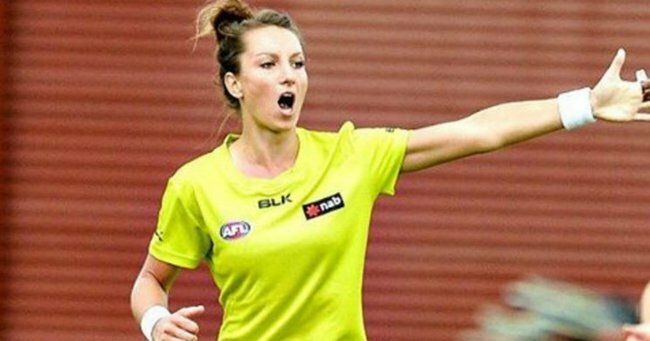 She will join the three female umpires already in AFL ranks, Chelsea Roffey, Rose O’Dea and Sally Boud behind goal.